With a recent afternoon to myself I decided to take a quick trip down to Camden New Jersey to check out a piece of history I’ve been wanting to check out for a long time. After about a 45 minute drive south on 295 I arrived at the recently renovated Camden Waterfront that includes the Adventure Aquarium, the Camden Riversharks minor league baseball team, and the Children’s Garden. But what I was here for was the huge battleship The USS New Jersey also knows as the “Big J”. 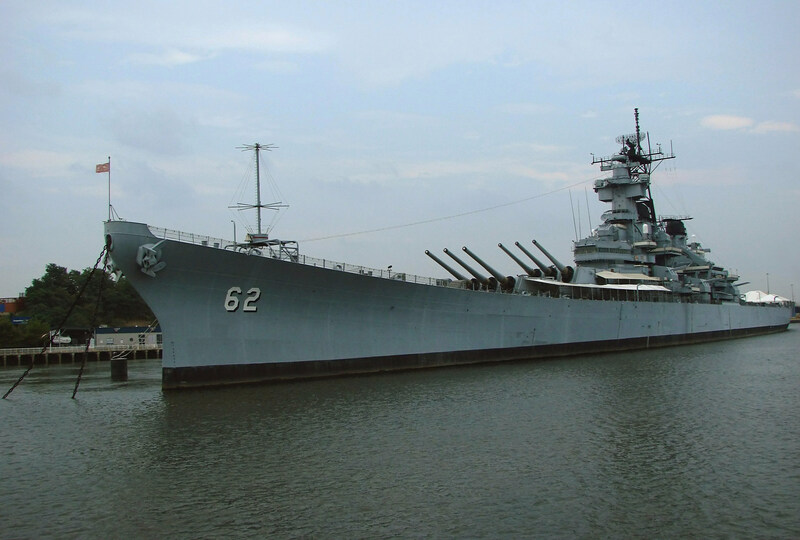 The USS New Jersey (BB-62) is an Iowa-Class Battleship. It’s 887 feet (270.54 meters) in length, has a beam (width) of 108.2 feet (33.0 meters), a displacement of 58,000 tons, and had a crew of over 1,900 sailors. It was launched in 1942 and served in World War II, The Korean War, The Vietnam War, and the Lebanese Civil War. The battleship was decommissioned for the final time in 1991 after serving a total of 21 years in the active fleet. 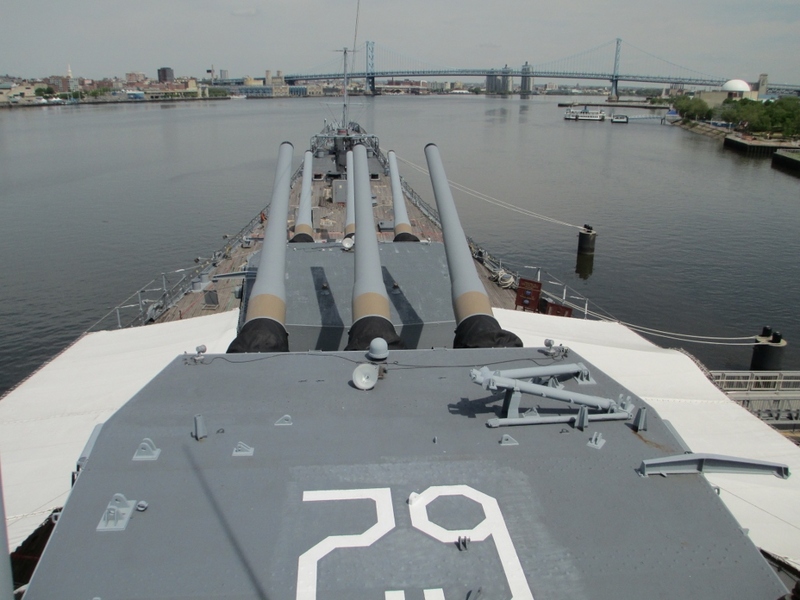 In 2000 it was announced that the USS New Jersey would become a museum located at its final resting place on the Camden Waterfront. Whew, now with all technical background out of the way let me say this is really an amazing ship (Sorry in advance as I’ll probably say that a few more times). 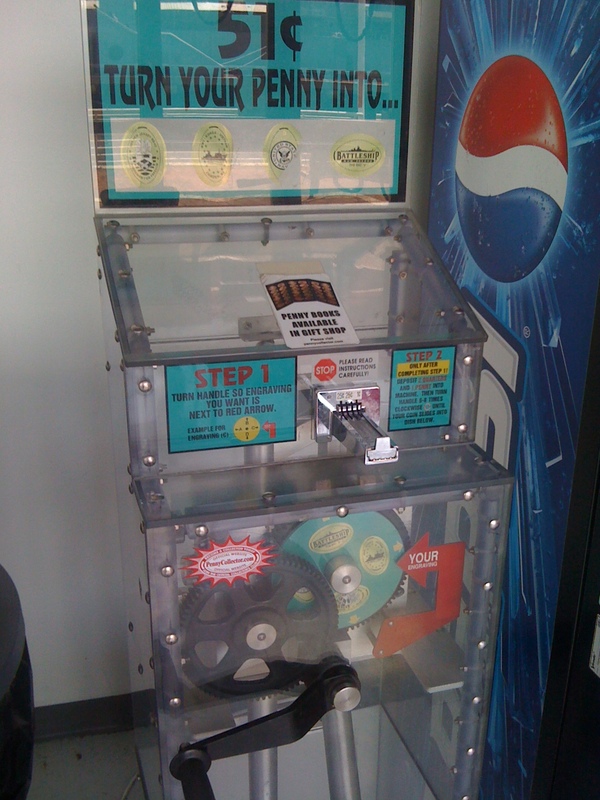 Before I actually went aboard there was a penny machine available right outside the gift shop on the dock. You do not need to pay any admission to use the machine, but if you make the trip here I would highly recommend spending the money and taking the tour. 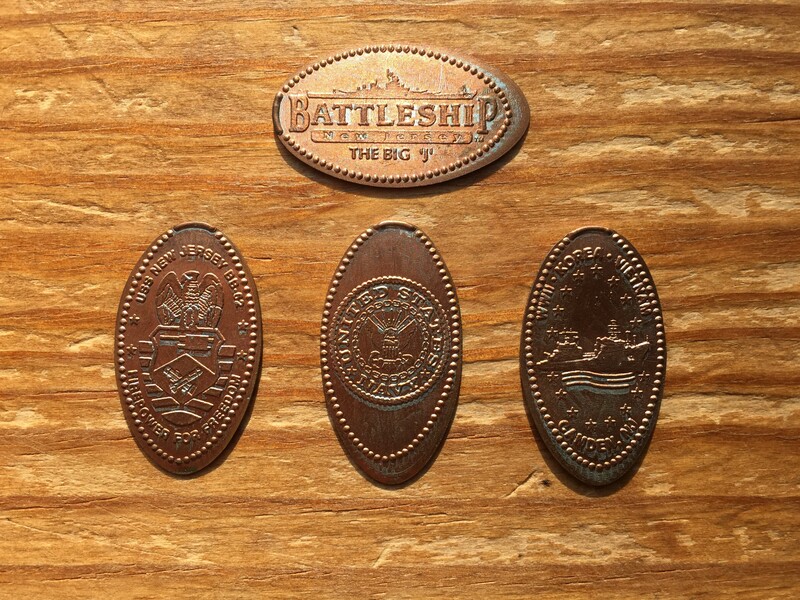 As you would assume the designs on the pennies incorporate the battleship in them. The machine as shown above is a 4 design hand crank model. The designs include: Battleship New Jersey The Big “J”, BB-62 Firepower for Freedom Shield, United States Navy emblem, WWII / Korea / Vietnam. With the pennies in my pocket I was ready to climb aboard the ship. There are two different tours you can take. There is a self guided tour which I opted for just due to a limited amount of time I had available that afternoon. But there is a guided tour available which is usually given by a very knowledgeable Veteran which gives a lot of personal insight of what it was like on the Battleship. The self guided tour is done by following a special colored light painted on the deck of the ship and takes you in through all the different areas of the ship. 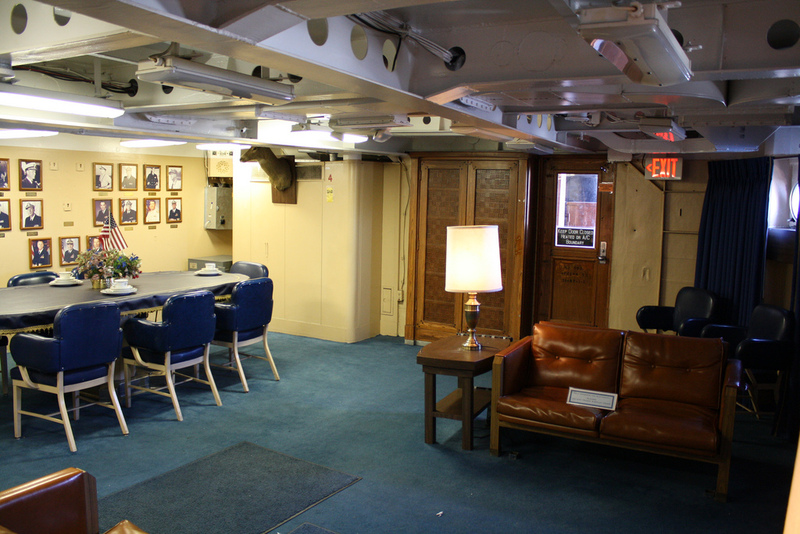 Each area has a ton of information and historical pictures available to give you more details about what it was like on board. 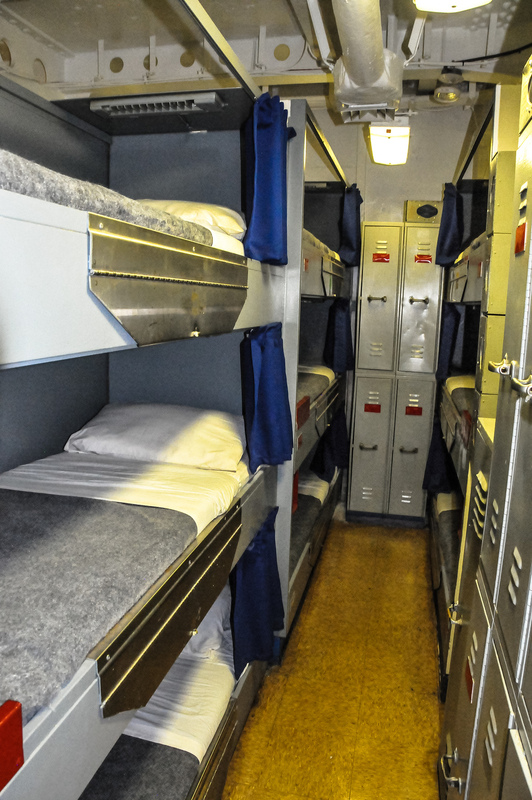 In the crew quarters you get a sense of how the more than 1,900 sailors were all packed into this ship. It really is a huge floating city, but was hard to imagine that many people on all at once. Luckily I was only there with about 20 other people and it was still pretty cramped walking through the different areas. 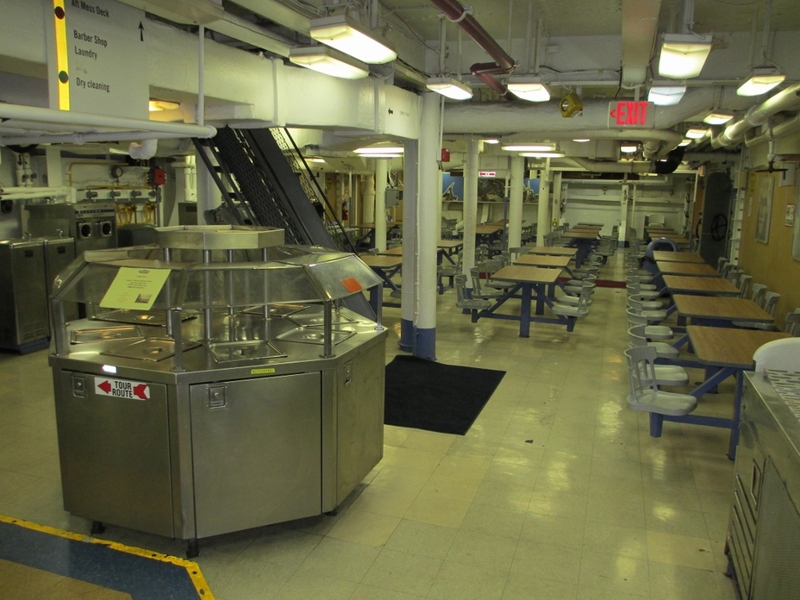 Above is a picture of the mess deck that fed the crew. As you can see there was very little space that wasn’t used for some purpose. Last up was the Captains in port quarters. This was apparently mostly used for entertaining purposes, but gives a very interesting perspective of life on the USS New Jersey. After my experience here I really want to head into New York and check out the USS Intrepid. I may even come back and take the guided tour just to get some more details about what it was like to serve on this amazing Battleship. Great article! I live in Philly and I’ve been meaning to make it over the bridge to NJ and check out the battleship for a while now. I’ll be sure to press a set of pennies when I go.